A little boy has a toy boat. He made it out of a can, a cork, a yellow pencil, and some white cloth. 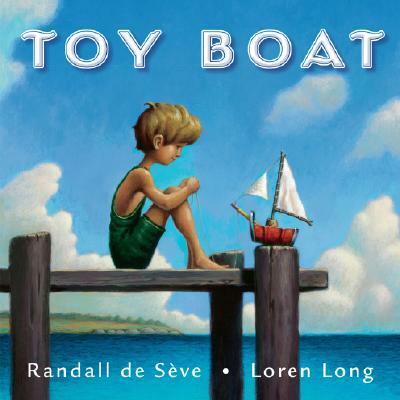 The boy and his boat are inseparable, until one day when the wind pushes the toy boat out into the wide lake. Alone now, the little boat must face fierce waves, a grumpy ferry, a sassy schooner, and a growling speed boat. How the little boat misses the boy! But if he is going to survive, he must figure a way to do it on his own. Loren Long has a timeless and magical touch. As he did with The Little Engine That Could, he creates a world of toys and children that go right to the soul. Toy Boat will sail into young hearts and stay there. Loren Long grew up in Lexington, Kentucky. He pursued graduate-level studies at the American Academy of Art in Chicago after graduating with a BA in Graphic Design/Art Studio from the University of Kentucky. After graduation Long worked as an illustrator for a greeting card company in Cincinnati before beginning his career as a freelance illustrator. Since then, Long has received numerous accolades for his fluid WPA painting style. He has been awarded two gold medals from the Society of Illustrators in New York, and has been frequently selected for their annual exhibition and book. His work has also appeared in many other major annual exhibitions such as American Illustration, Communication Arts, Step By Step Graphics and Print. Long’s clients include Time Magazine, Reader’s Digest, Forbes, The Wall Street Journal, Atlantic Monthly, Boy’s Life, Land’s End, Sports Illustrated and HBO. He has also illustrated book covers for numerous publishers and has recently concentrated on illustrating books for young readers where his work has garnered much recognition and praise. The United Nations chose to hang in their lobby Long’s painting of a firefighter in action, along with 21 other selections from the Prevailing Human Spirit Show at the Society of Illustrators. Recipient of the Golden Kite Award for picture book illustration, presented by the Society of Children's Book Writers and Illustrators for I Dream of Trains. The book was also selected as one of the New York Public Library’s 100 Titles for Reading and Sharing, 2003. Winner of the Parents' Choice Gold Award.